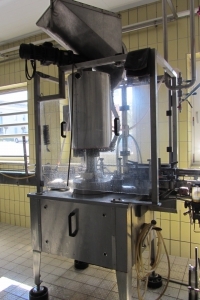 Screw capper, make Bertolaso, type: TF 100/4, with 4 heads, for 18 mm / 28 mm and 31,5 mm aluminum and plastic caps, direction: left->right, built 1994, L: 1,25m, W: ~1,0 m, H: 2,15 m, bought used but not installed, ex location for 11.000 € o.n.o. sale. 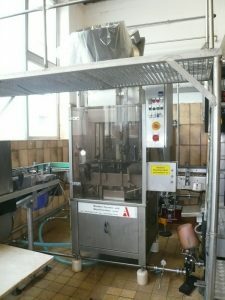 Descrewer, make Adelski, parallel machine, with 12 heads, adjust to 0,7 lt mineral water-bottle, built 1998, ex location for sale for 13.800 €. 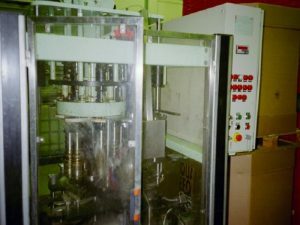 Screwsealer, make Zalkin, type: CA 6/320 NG, for 13.000 b/h, 6-head machine, left->right, adjust to 0,5 lt PET-bottles with 28mm plastic seal, built 1995, ex location for sale for 18.000 €. Further capper / screwer are available – please ask for our list.